M. Carolyn Baum is the Elias Michael Director of the Program in Occupational Therapy and professor of occupational therapy, neurology, and social work at Washington University School of Medicine in St. Louis, Missouri. She is internationally recognized as an influential leader in the profession of occupational therapy. Dr. Baum conducts research to understand the factors and effectiveness of interventions to support the daily occupations of older adults as they seek to live as independently as possible. She serves as a mentor to early and mid-career scientists and teaches the next generation of researchers, educators, and clinicians. Earlier in her career, Dr. Baum worked at the University of Kansas Medical Center in Kansas City, where she started a cardiac rehabilitation program. Later, Dr. Baum accepted a position at the Research Medical Center in Kansas City, where she started the rehabilitation occupational therapy program. There, she became first the director of rehabilitation and then the director of physical medicine and rehabilitation, managing occupational, physical and speech therapy. In 1976, she was recruited to run the occupational therapy program at Irene Walter Johnson Rehabilitation Institute at Washington University School of Medicine in St. Louis. Her drive to incorporate science into occupational therapy led her colleagues to encourage her to apply for the director position of the Program of Occupational Therapy in 1988. Thirty years later, she continues to advance the field forward by bridging the gap between biomedical and sociocultural health. Dr. Baum earned a bachelor’s degree in occupational therapy from the University of Kansas in 1966; a master’s degree in health management from Webster University in St. Louis in 1979; and a doctorate in social work with a concentration in social policy and aging from the George Warren Brown School of Social Work at Washington University in St. Louis in 1993. She also earned an honorary doctorate from the University of Haifa in 2008. Throughout her career, Dr. Baum has joined and held leadership positions in prominent organizations such as the American Congress of Rehabilitation Medicine, the American Occupational Therapy Association, and the American Occupational Therapy Foundation. In addition, she has authored numerous articles and books. In 1983 and from 2004 to 2007, she was president of the American Occupational Therapy Association and from 1986 to 1993, was president of the National Board of Certification of Occupational Therapy. 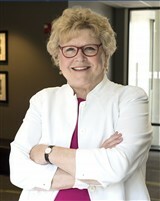 In recognition of her success, Dr. Baum was inducted into the Academy of Research of the American Occupational Therapy Foundation in 2008, named an Outstanding Public Health Transdisciplinary Scholar by the Institute for Public Health at Washington University in 2012, and received the Meritorious Service Award from the American Occupational Therapy Foundation in 2017. She has earned a number of other accolades over the years, including the Outstanding St. Louis Scientist Leadership Award and fellow from the Academy of Science of St. Louis, the Stanley J. Coulter Lecture Award from the American Congress of Rehabilitation Medicine, the Distinguished Faculty Award from Washington University in St. Louis, the President’s Commendation Award from the American Occupational Therapy Association, and the Allied Health Distinguished Alumnus Award from the University of Kansas. Her achievements were highlighted in numerous editions of Who’s Who in America, Who’s Who in Medicine and Healthcare, Who’s Who in the Midwest, Who’s Who in the World, and Who’s Who of American Women.